Last year after the holidays, I picked up a few of these Heart and Sole skeins of yarn on sale in the color “Christmas”. I wasn’t quite sure what I’d do with them, but sale + yarn + Christmas = I’m buying it. I brought them home and stashed them away with the rest of my yarn hoard and knew that the perfect opportunity would arise to use it. And it did. 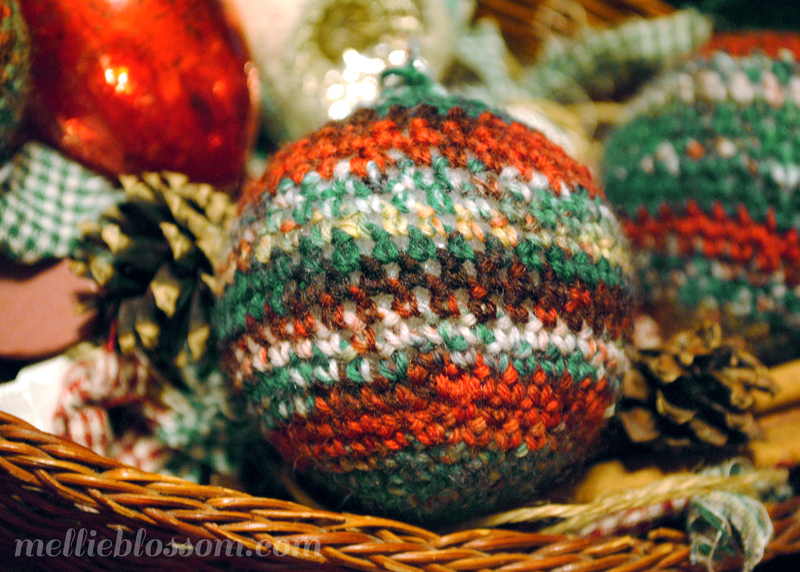 After I contemplated all the different kinds of crochet Christmas ornaments I could make for this swap, the yarn came to mind and I knew right away that this was my chance to use it. But as I searched among the patterns online, I couldn’t decide what exactly I’d do with it. 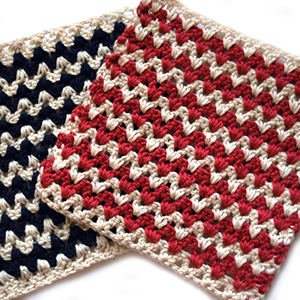 Variegated yarns often make complicated patterns look so messy and busy, and I wanted something simple and elegant. 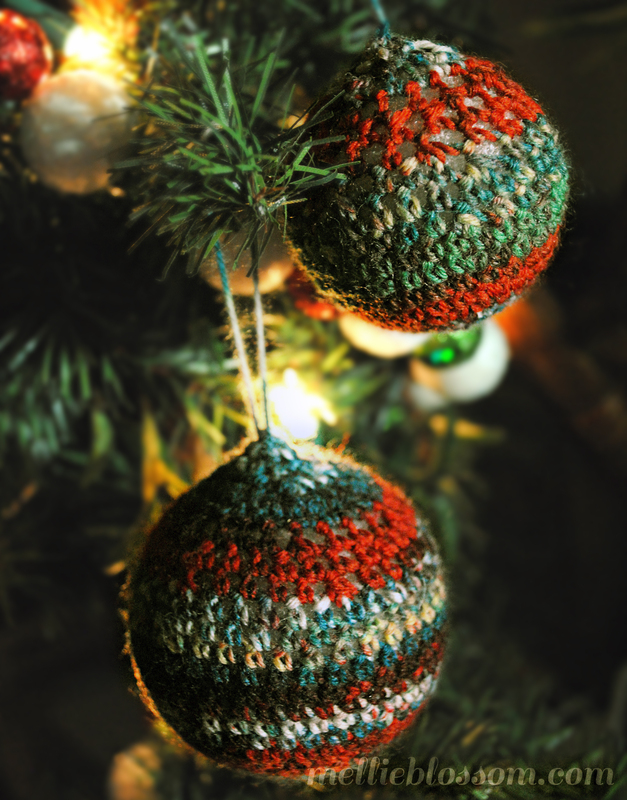 I finally decided that a simple hanging ball would perfectly complement the design of the yarn and work for all sorts of Christmas decorating styles. I picked up a bag of Styrofoam balls at my local craft store and just started crocheting a circle. When it got to be the size of the ball, I stopped increasing and did a few rounds around and then decreased to the top, adding a simple loop to hang it on the tree. You would be surprised at how happy this little hanging ornament made me! I even went on to make half a dozen more for my own tree. I think next time I would use a smaller hook (I used an F, and you can see in the pictures that in some spots the Styrofoam still showed through). But from where they hang on the tree, it’s not at all noticeable so I’m not too concerned. From this point, keep increasing by one extra stitch around until you reach the size that fits snugly around the Styrofoam ball’s middle. 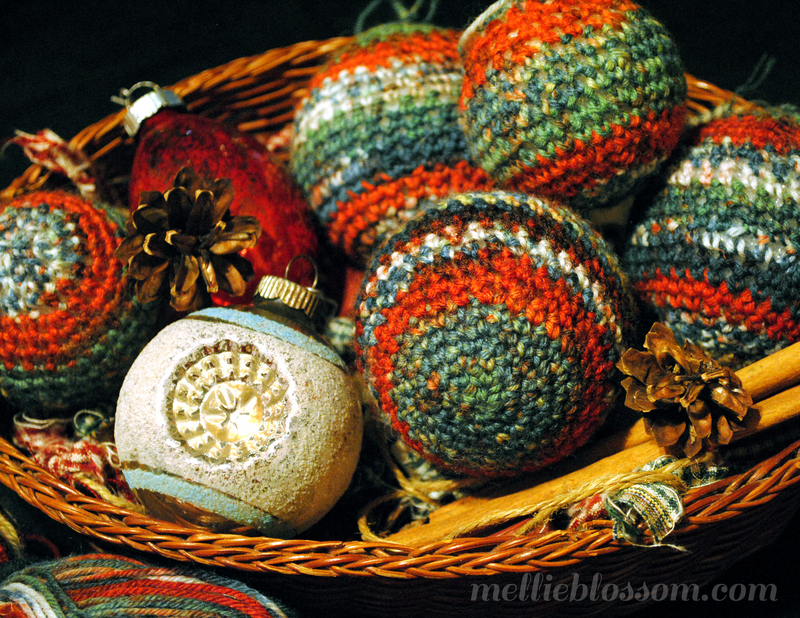 This will vary depending on the size of your Styrofoam ball and the hook and yarn size that you’re using. Once you reach the middle, make a few rounds. Your goal is to have the top half and bottom half of the ball be symmetrical. So count back from the middle round and then start decreasing. To decrease, note the number of stitches from your last increase row and skip that many before decreasing. So, if your last row was the same as my Round 6 above [1 sc in next 4 stitches, 2 sc in the stitch after], you will instead [1 sc in the next 4 stitches, 1 dec in the next 2 stitches]. Basically you’re just stepping your rounds down instead of up. Continue until you have only 8 decreases and then pull a knot through the last one, closing tightly. Leave a tail of a few inches, and then tie a loop, weaving the ends in tightly. Voila! Your new Christmas ornament! I know that’s a little vague, but since my bag of Styrofoam balls were a variety of sizes, I just kind of winged it. There’s a lot of flexibility though, so little mistakes here and there weren’t even noticeable. 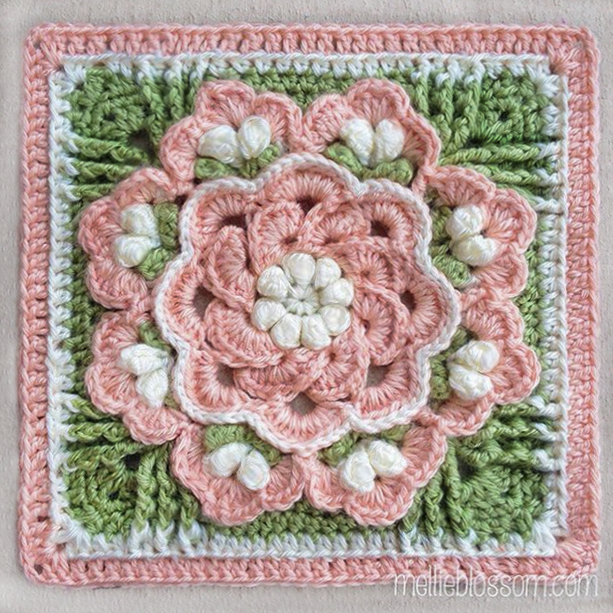 It’s a fun little pattern and a pretty yarn. I have one all tucked away for my swapmate along with the rest of her gift. All I need to do is run out and grab a little bit of chocolate to include in the package (plus a little extra chocolate for me, of course) and this will hopefully reach her before December 1st with enough time to deck the halls. These are nice! I like how simple they are. Thanks for the pattern.